The ability to create a sense of peace and calm when meeting someone gives you an advantage in your ministry. Our Hands-Free Watchtower Magazine Tote gives you access to everything that you need, letting you appear organized and at ease. First impressions can occur only one time, and your door-to-door ministry deserves the best. A genuine leather tote that has custom pockets to accommodate your books, papers and iPad or tablet offers conveniences that standard briefcases cannot match. Our designers created a beautiful work of art that complements any ensemble while providing a durable pouch. Fitting comfortably over your shoulder and resting on your opposite hip, this tote lets you instantly find the materials you need while you start your presentation. Nearly half a million Americans use sign language, making it the fourth most-used language in the United States according to Gallaudet University. Imagine the reward of presenting your message to the deaf population in the language they prefer. Our pouch lets you preach from your heart and speak with both of your hands. You have an instant bond that enhances your words. Making a graceful exit after you deliver your message influences your listeners almost as much as your entrance. Without requiring you to set down a heavy briefcase to open a door, our Messenger Style Watchtower Tote allows full use of your hands. Convenient access to the magazines in your tote lets you share the latest Watchtower or Awake! with someone who may not know of them. The American Psychological Association recognizes the importance of ergonomics or comfort design in the workplace, and you can benefit from this as well. Designers of our Hands-Free Watchtower Magazine Tote used principles of the science to create a load-carrying system. The strap fits comfortably over your shoulder so that it does not interfere with your posture. The ergonomic design of our tote distributes its weight, making it excellent for your back, arms and hands. 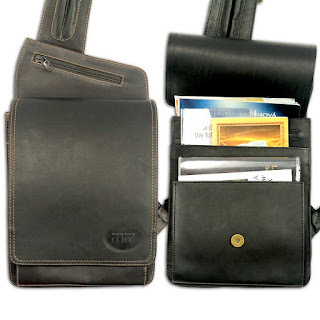 Your choice of black or chocolate leather gives you a pouch that is handsomely designed to hold large as well as small items. The strap includes a zipper pocket and holders for your pens, a convenience that prevents delay when you need to write a note. The tote holds your 1984 or 2013 New World Translation, and a handy pocket accepts a medium bible. You can put up to 30 magazines in a large pocket, and a smaller slot fits your tracts. A discreet pocket is appropriate for donations. Our Hands-Free Watchtower Magazine Tote gives you the confidence to go forth in your ministry in an organized manner.